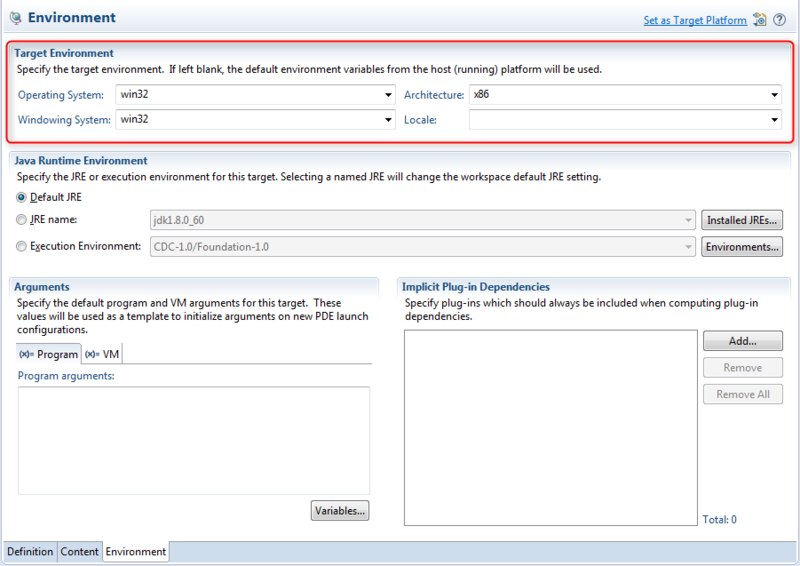 Typically the development environment should not be dependent on the target environment the application should run on. For creating an Eclipse RCP application using SWT, this is not as trivial as it looks like. The reason for this is the fact that the SWT implementation is packaged in platform dependent bundle fragments. But it is possible to setup the workspace to make that work, which I will show in the following blog post. You need to maintain an Eclipse RCP application that makes use of 32-bit Windows native libraries. Since you got a brand new laptop or PC that runs a 64-bit Windows, you install the 64-bit version of Eclipse. 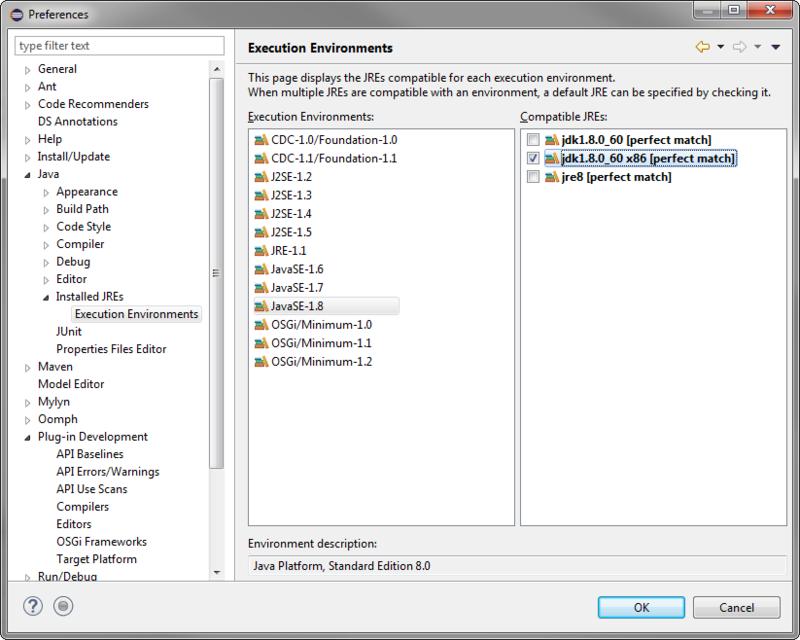 As you are aware that you need to execute the application in a 32-bit JVM, you add a 32-bit JDK via Window -> Preferences -> Java -> Installed JREs and configure that JDK as the default for the JavaSE-1.8 Execution Environment. The reason for this is clear, you installed a 64-bit Eclipse, therefore you only have the 64-bit bundle fragment of SWT in your installation. But you need the 32-bit SWT fragment. This can be solved easily by configuring the target platform appropriately. Now it is possible to execute a 32-bit application from a 64-bit Eclipse IDE via .product file -> Launch an Eclipse application. Note: Remember to start via the .product file and not via an existing run configuration, because the run configuration needs to be updated for the environment settings. This entry was posted in Dirk Fauth, Eclipse. Bookmark the permalink. I’m currently developing on 32bit Windows but need to export for 64bit Linux. This solves the SWT problem but I need to bundle a JRE with the application (requirement). In the product editor you can only specify a runtime per operating system. Is there a way to do this with respect to the architecture as well? I am not aware of that. But as Tycho does also not consider that setting, I use root files if I need to provide a JRE with my application.